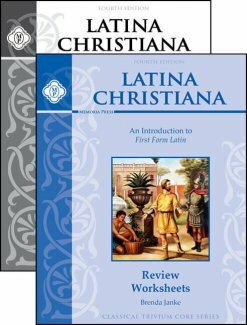 The Latina Christiana Student Book is both the text and workbook for the Latina Christiana program. 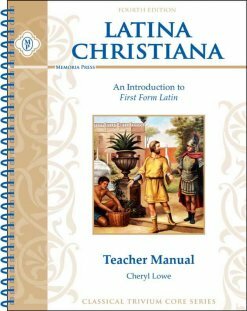 The Latina Christiana Teacher Manual contains all the answers to the Student Book, as well as the quizzes and tests, and their key. 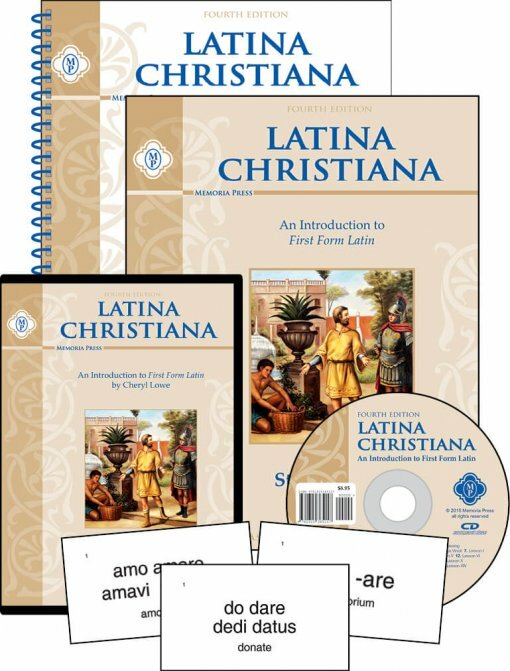 The Latina Christiana Pronunciation CD gives the correct pronunciation for each lesson and for the prayers and songs in LC. 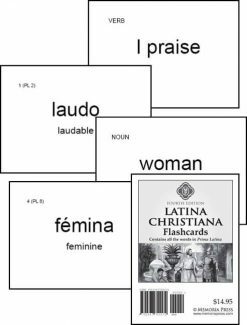 The Latina Christiana Flashcards, Fourth Edition, are a cross-resource that includes all the words for Prima Latina and Latina Christiana. 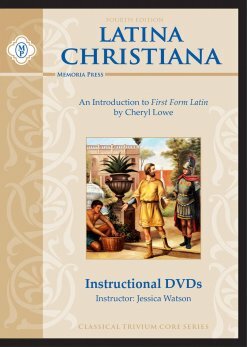 The Latina Christiana Instructional DVDs brings a master Latin teacher into your home, providing additional expert instruction. Each lesson is approximately 15 minutes. Latina Christiana is, quite simply, the best Latin grammar course available for younger beginning students. You can also purchase the Latina Christiana Set with Online Instructional Videos (Streaming) instead of the set with DVDs. 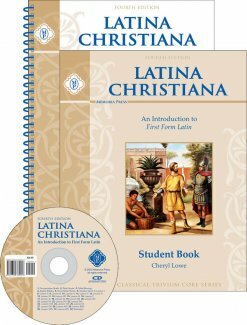 Cheryl Lowe’s clear explanations, easy instructions, and step-by-step approach in the Latina Christiana Complete Set have led thousands of teachers and students to declare, “I love Latin!” With the help of this course, you are sure to love Latin too! Latina Christiana was designed as a beginning course for students of all ages. This course was specifically written for the teacher with no background in Latin. 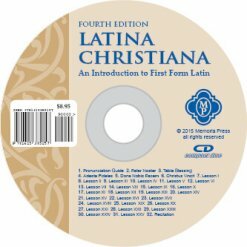 Students who have completed Latina Christiana are now ready for the First Form Latin Series. Memoria Press recommends students move directly from Latina Christiana to First Form. There is an optional history component to Latina Christiana taken from Chapters 1-13 of Famous Men of Rome (reading selections not included in LC). Drill questions are included in Latina Christiana, as well as a history test. Learning the history and culture of Rome is often a great motivating factor for students studying the Latin language. 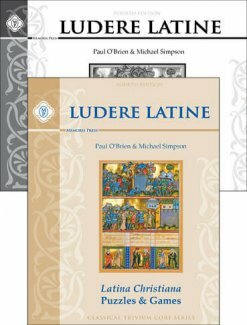 For a more in-depth study of Roman history, consider the Memoria Press Famous Men of Rome Set. These supplemental Review Worksheets will help your students master the grammar and vocabulary they are learning in Latina Christiana. Each lesson has 1-2 pages of cumulative review, so your students get weekly reinforcement of review material as well as newly learned concepts. 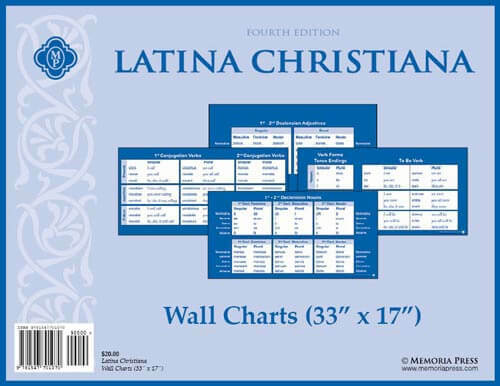 Need Lesson Plans for Latina Christiana? 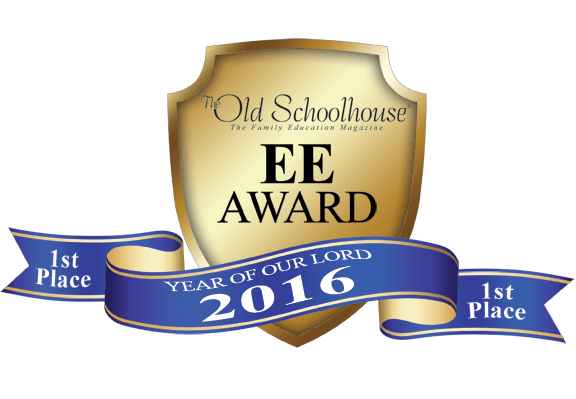 Click here to purchase a printed or digital version. Latina Christiana is a perfect step for someone wanting to enrich their child’s education, as well as their own. I love learning alongside my daughter. Because of Latin, I know and understand the English language better than ever. 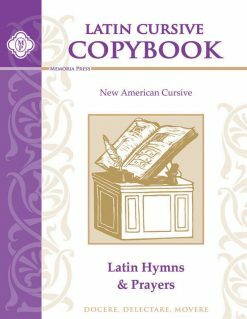 I’m looking forward to continuing to teach my children Latin through Memoria Press! We are happy with Latina Christiana. I am currently teaching my third child using this full program. The children like having the DVD to watch and have a change of scenery from me teaching everything. It has been a good start to their Latin learning. My son is using Latina Christiana this year. He enjoys the video sessions and seems to enjoy learning Latin in general. I am learning, too! The only negative, is sometimes the teacher guide does not exactly match up with the student workbook pages, but it’s not been a big issue. This is our first year using Memoria Press. I have no Latin experience, but teaching Latina Christiana has been simple and enjoyable. The teacher’s manual and pronunciation CD make me well-equipped, and I love that I’m learning Latin alongside my children.